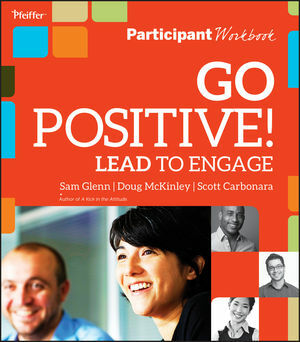 Based on the most recent scientific, behavioral, and psychological research and the workshop authors' collective, 60-plus years of experience fostering positive attitudes, the Go Positive: Lead to Engage workshop gives you the resonant answer to the question: How can I maximize the attitudesand ultimately, the performanceof my employees, even amidst very chaotic and uncertain times? Sam Glenn is the best-selling author of A Kick in the Attitude (Wiley), and a humorous, award-winning keynoter on the power of attitude in the workplace and beyond. Sam presents frequently to Fortune 500 companies and other organizations wanting an attitude recharge (www.SamGlenn.com). Doug McKinley, PsyD, MCC (Certified Coach), is founder and CEO of McKinley Leadership (www.TMGLeader.com), a training and coaching firm. McKinley has years of experience working with leadership across such industries as healthcare, financial services, insurance, and not-for-profit. Scott Carbonara, known as "The Leadership Therapist," is an international speaker, trainer, author of A Manager's Guide to Employee Engagement, and management consultant on the topics of communications, employee engagement, customer service, and change management. (www.LeadershipTherapist.com) Scott pulls from his diverse background—from working as an award-winning crisis counselor, to serving as director of communication and change management and eventually executive chief-of-staff of Blue Cross/Blue Shield.